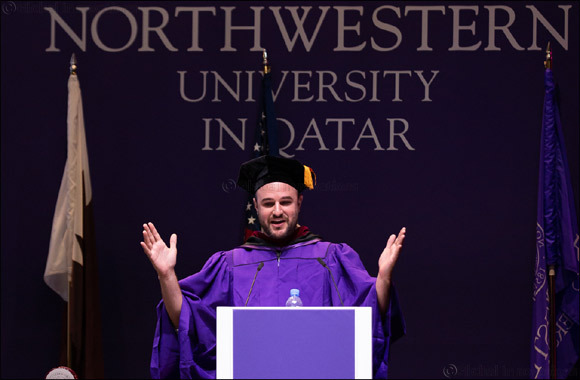 Doha, Qatar – September 4, 2018: Speaking at Northwestern University in Qatar’s annual Convocation, Hollywood producer and Northwestern alumnus Jordan Horowitz advised the University’s incoming class to forget about their expectations and to focus on the process. The Convocation – an annual event that marks the beginning of the academic year – was attended by NU-Q faculty and staff, along with members of NU-Q’s incoming class, family and friends. In explaining this advice, Horowitz pointed to his unsuccessful films early in his career – all of which did not meet his expectations. As his career developed, Horowitz revised his methods and with the movie La La Land he saw success. what we expected people to think of the movie, we found our success in the process,” he told the audience. Also speaking at the convocation was NU-Q Student Union Alessandra El Chanti who reinforced Horowitz’s message and told her fellow students as Northwestern students they should dream big. “Here at NU-Q, communication students are not only filmmakers and journalism students are not only reporters. We are grander than just that. We’re researchers, leaders, storytellers, and aspiring professionals in the vast field of media. There is so much to learn and even more to create. Here, you are allowed to dream bigger. You have all the resources in this university to make that happen,” El Chanti said. During his visit to NU-Q, Horowitz also spent time advising students in the classroom, participated in a community meeting, and hosted a special screening of La La Land for the NU-Q community. Students were also invited to ask him questions about his work, inspirations, and experience in Hollywood. The more than 100 members of NU-Q’s Class of 2022 inducted at the Convocation ceremony is the largest in the school’s history and joins Northwestern’s global family numbering more than 250,000 alumni around the world, including a number of notable figures and celebrities who are leaders in the media industry.